This is an advertisement for a comic entitled Harberd's Comicalities. 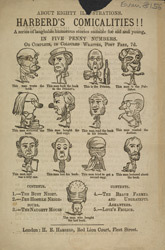 The 19th century saw a boom in the number of comic periodicals published. They were written primarily to entertain the lower and middle classes. There was a great need at this time for escapist entertainment; working and living conditions were tough for many people and humour was one way of coping with this. The great British tradition of laughing at ourselves can be detected in these comics.